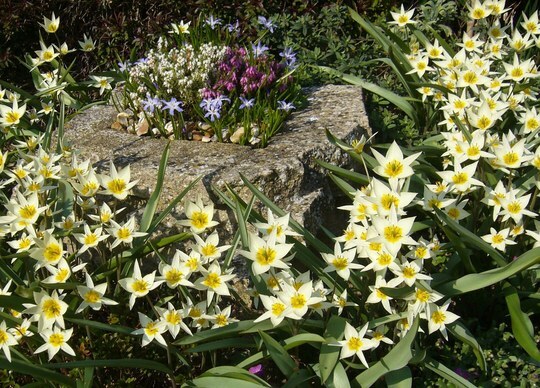 SUNNY SMILES from Tulipa turkestanica and Chionodoxa, with white and purple heathers. My front garden. March. 2009. Gorgeous TT, are those the ones that open in the sunshine? Yes TT anyone would be very happy with this display. It's lovely. The central rock feature is concealed by the tulips. I made it by cementing 'recycled' broken concrete sections together. Lol. Looks good from where I sitting TT. When the tulips finally go over all will become clear, or are you going to put something else in this area? The aubrieta and other small rockery plants take over next. If you look at the photo of Bonsai my Welsh Terrier ~ between photo of Emergency Nurse and pics. of my dogs with their mowers ~ it shows the flowers nearby. They grow up and out, providing colour in front of the tulips. bulbs are my concern, what do you do? take them of the soil and storte them to the next season? and then plant something else there? I leave these bulbs in place. But I do understand what you mean, Aleyna about bulbs being a challenge. It is so easy to dig them up accidentally after they've died down. Because my tulips are planted around the rock feature, I remember where they are ! Lol. Fortunately, these bulbs are in the front garden where Truffle isn't permitted to do his gardening unsupervised. Lol. I've just taken a look at the pic of your front garden rockery plants. The aubretia is stunning and I particularly like the two tone brown plant sitting on the lawn. I love this pic TT, going straight to my favourites. How are you and Fiji ? Am good thank you TT, yes you have some beautiful flowers!! Wow TT.Your front garden looks stunning. Wow, it is truly a sprintime bouquet! Lovely!!!!! How has Truffle been with plants in the backyard? Wow these make me smile too! Your English is very good ! and we all make those. Lol. What a spectacular sight TT. They're like stars. Yes, they do look like stars. Fantasic tulipa lovely the way they frame your rockery, very happy feel to this picture. ~glad the weather has been kind! Aw, Tt, this is so cheerful and bright - fantastic! Very beautiful scene ! Thanky you !! Do you plant new bulbs of the tulipa every year ? I planted Chionodoxa with pink and purple 6 years ago. Since then, pink didn't increase bulbs and flowers of two stems come out in every year. Purple increased and flowers of 4 stems this year. Provably This will be the results as i didn't any care. I planted these tulipa a few years ago and they stay in the ground, multiplying every year. I've only ever tried the blue/purple Chionodoxa. I haven't noticed any increase in numbers. They stay about the same. I'm glad you like this photo ! What a heart-lifting spring combo. Just what I needed to see to cheer me up on a cold rainy day. Thanks! Yes, this week is turning out very cold and windy, isn't it ! Very nice corner of the garden. The tulips are stunning. Can you tell me please where to look at photos of the shorter, fatter tulips, with bigger petals, which open in the sun, please ? Do you have those in your garden ? I inherited some when I bought my house, but they didn't like being moved when I redesigned my garden. So I don't know the names ! Thanks. Not quite sure what you are asking me, Terratoonie. One source of pictures of tulip bulbs could be the ilustrated on-line bulb catalogues. Try Miniature Bulbs from Yorkshire (www.miniaturebulbs.co.uk). I bought a number from them last year. A book I could recommend is 'Tulips, Species and Hybrids, by Richard Witford. The Forum on the SRGC site has lots of pictures and discussion on the rarer species (Bulbs General/Tulipa 2009). I will try and add photos of mine but I am not going out at the moment -raining, windy,cold! Thank you. Weather is horrible outside right now ! I was hoping from my description you might know which tulip I was describing. Not very tall, big petals, opens out when the sun shines. I guess I should mention it under questions. Thanks for the miniature bulbs link. I've had a look at that. Right, you want a name for a specific tulip - whew. OK, how does Tulipa humilis sound? This matches your description fairly well. It should be in flower now - as long as the sun is shining! ....and secondly for finding the right tulipa. I can now feel that I've earned my G&T. These look beautiful TT. What a lovely sight it must be in your garden. That would make eveyone smile. Today my gardens had hailstones falling all over the place ! those are wonderful TT, what a display!! Let's hope the sunshine comes back tomorrow. I know I don't grow enough bulbs and I've been looking at the garden to see where I could grow more. I really go for perennials, and I don't like the leaves dying off in my flowerbeds - so I tend to stick to containers for bulbs! We have loads of bulbs in plastic pots which we partially submerge amongst the shrubs. When they've gone over we put them out of sight to die down at their leisure! Now that's a good idea - why didn't I think of that? I already do it with Lilies and I have sunk two pots of Allium christophii...thank you very much! Good thinking to sink the tubs of bulbs amongst other plants. What treatment do you give the tubs when the bulbs have finished flowering ? Do you store the bulbs in the tubs ? Do you put the tubs in the shade ? Do you let the compost dry out in those tubs which contain bulbs ? The height difference does help make the effect here. I have aubrieta and other rockery plants just outside the tulips, and as the tulips die down, the aubrieta colour gets taller which means the tulip leaves are not really visible. Your concrete planter is awesome! You have a real knack for arrangiing colors and plants. Nice photo. Hello Weeds ~ How are you ? I'm pleased you like this planting arrangement. I try to include blue and white flowers wherever possible. Very nice! You are gifted, you match flowers ad colours so well. I'm still under feet an feet of snow. stunning display TT, they look like they have been here for a while, well established and exactly how they should look. great combo. - i also love blue and white, i planted up a whole bed last year with blue and cream/white spring flowers, it is taking shape nicely, needs to establish and mingle in a bit more - just like yours has. a real inspartion TT. Sorry my GoY Canada map photo of hot sunshines hasn't worked to plan ! TT - we treat the bulbs in pots as though they were in the ground - we feed and water them and let them die down in an out-of-the-way part of the garden. Some bulbs fair better than others in coming back the next year - the tete a tete daffodils are great. Next year we bring them out again and give them a feed. that's such a poetic and beautiful way to describe my photo ! how did i miss this photo, thanks Toto for telling me about it. I know you grow these tulips, too. Oh so pretty TT! I'll have to put these tulips on my list for autumn planting! These grow easily in any soil it seems. where can I plant them ??? Lol. This is how sometimes lawns get smaller... and smaller.... and smaller...Lol. Conker my Sheltie needs grass to practise with his toy John Deere. Hi terratoonie, The scientific name, 'Tulipa' comes from tulipan in Persian archaic words. Tulipan means turban. I think 'Tulipa' you say, is best fit for the pretty tulip to give us a joyful feeling in spring. Your naming, to use scientific name, is fantastic. Thanks for explaining about tulipan meaning turban. I learn so much on GoY ! Yes, you're right, TT. I learn new things from GoY too, Thanks to all of you!